One of the things that I love about my blog is the interesting things I get to do with it, one day is never the same as the next! So when I was contacted by Luxury Flooring to see if I was up for this challenge, I thought ‘why not?’, it sounds fun! My hubby loves DIY, usually I come up with the ideas but he is the one that has to create them. So together we work quite well! 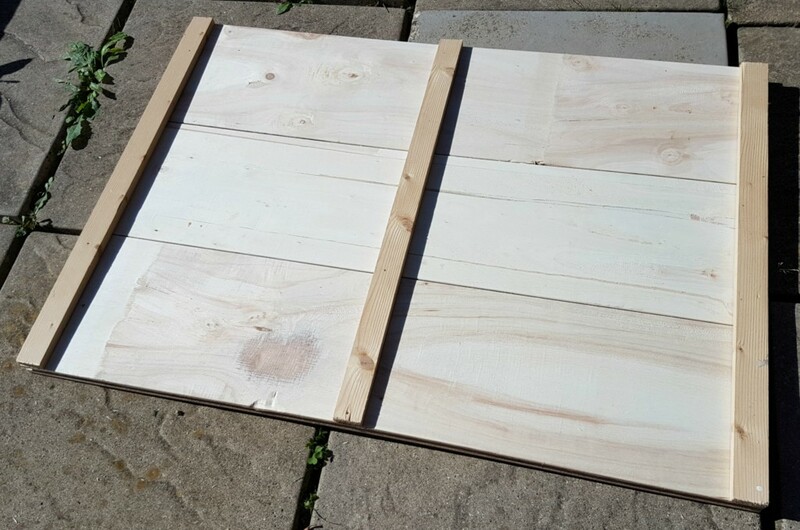 Quite often you have a pack of flooring left over from flooring projects, but I have never thought about making something with it so this was most definitely a challenge! 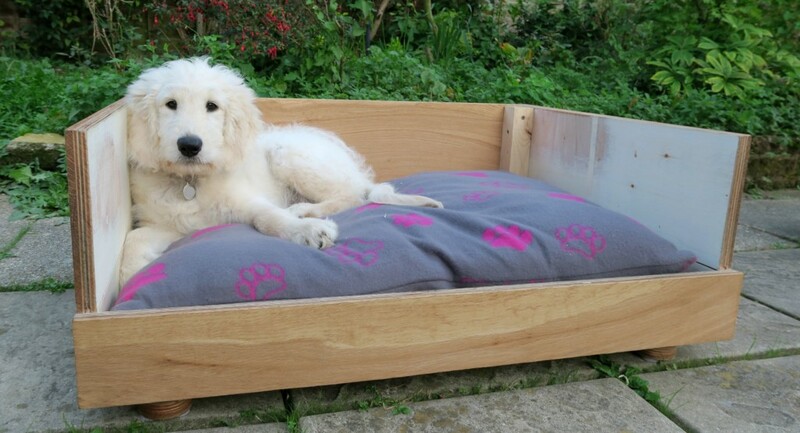 As we have recently welcomed our new puppy to our home, Gus, we came up with the idea of making him a nice wooden bed to sleep in. Yep, we like to push our ideas on what we can make! We were sent 1 pack of engineered wood flooring which matches my lounge furniture perfectly. I will now hand over to Hubby who will explain to you how he made it, I hope you like it as much as we do, and of course Gus loves it too! 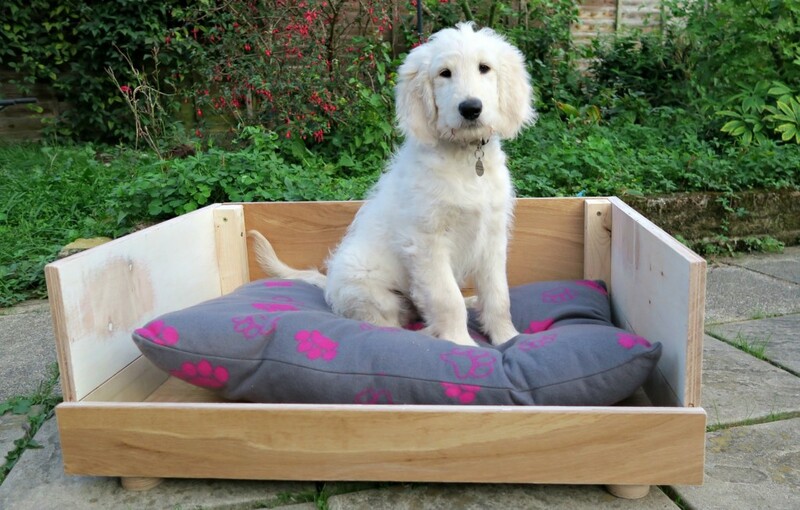 Already having the dog bed cushion give you a point of reference regarding the size to make everything which takes a lot of the guesswork out of proceedings. 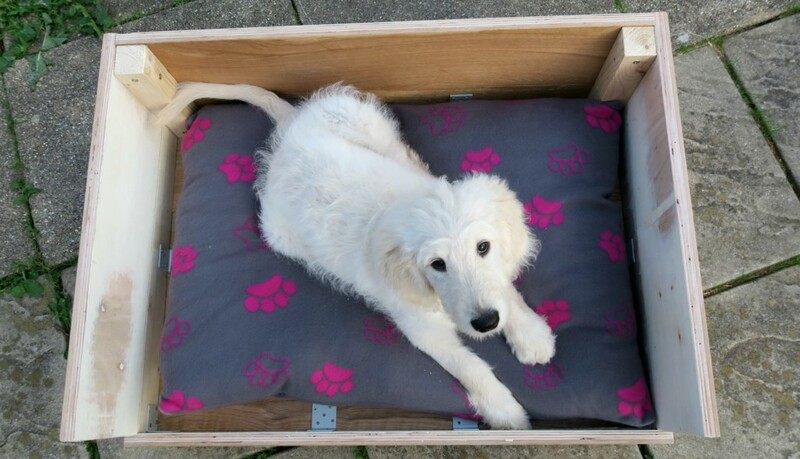 It has to fit in the bed! Firstly I cut three lengths of flooring to the length (longest length) of the bed cushion. 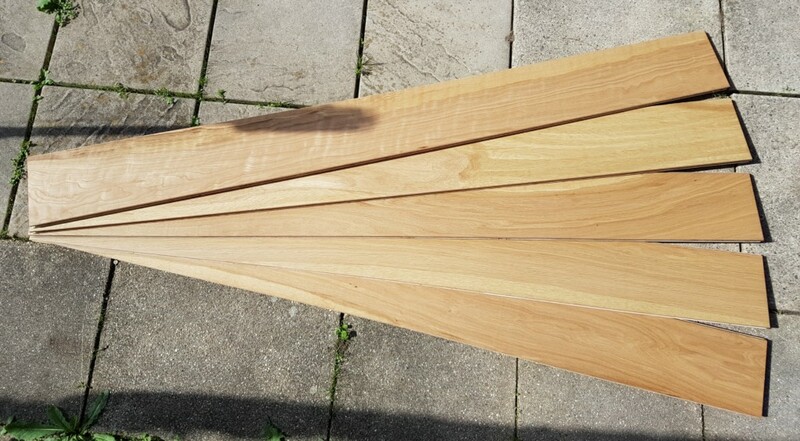 These lengths simply slot together as they have tongue and groove edges which makes the job a lot easier. Luckily three lengths of flooring happened to be just the right width to fit the width of the dog bed cushion. If it hadn’t been then they could have easily been cut to fit. Next, cut three lengths of thin timber batten to the exact width of the dog bed. Slot the lengths together to form the base not forgetting to run a thin bead of wood glue along the edges prior to assembly. Adding glue along the tongue and groove edges before putting together gives some added strength to the pieces and considering how big Gus is going to get I thought this was essential! 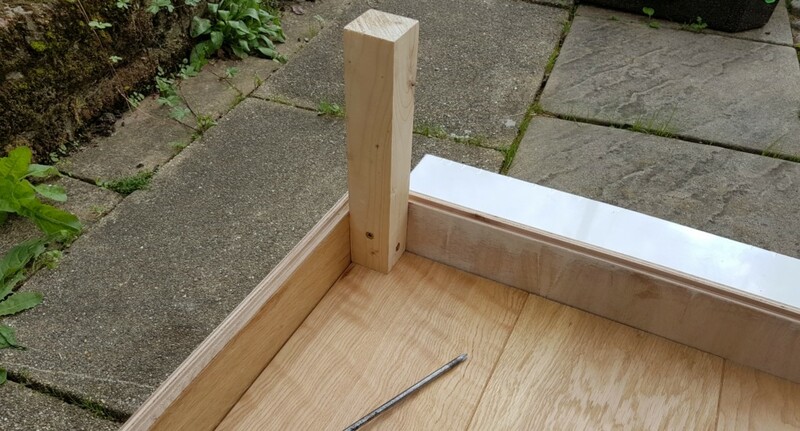 Turn the base over and lay the timber batten at right angles to the flooring, one at each end and one in the middle. 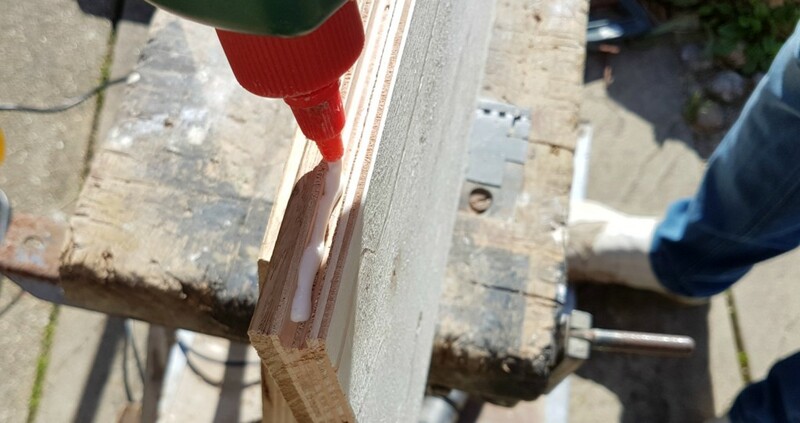 Screw these battens to the base with wood screws, three screws per batten at each end and one in the middle. The battens are to stop to base moving and flexing and to give added strength. You then need to remove to tongue edge (the bit that sticks out!) of one of the lengths of flooring that make the base. I used an electric plane for this. Then just a quick sand down of the all the edges to remove any rough bits. 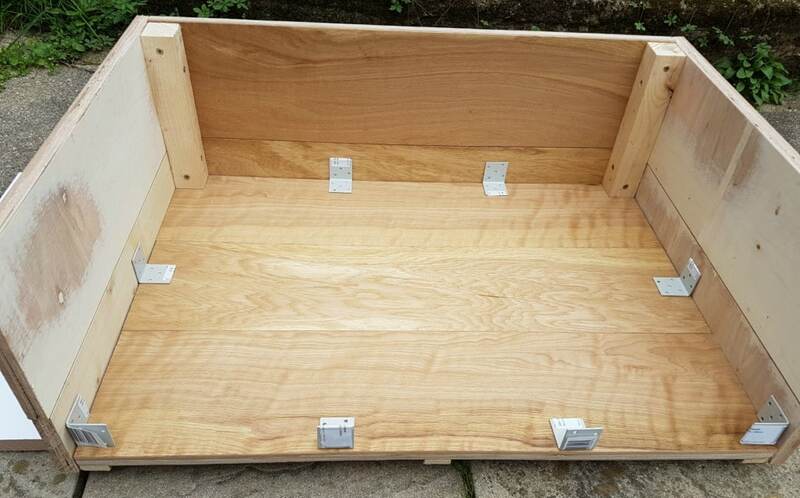 Next you have to cut the flooring for the sides of the bed. You first need to decide on how high you want the sides of the bed to be. We wanted ours to be higher than one width of flooring so had to cut a length of flooring in half, length ways. This gave us the extra height we wanted. These were glued and slotted together in the same way we did the base. Remove the tongue edges again and then quick sand down to remove rough edges. 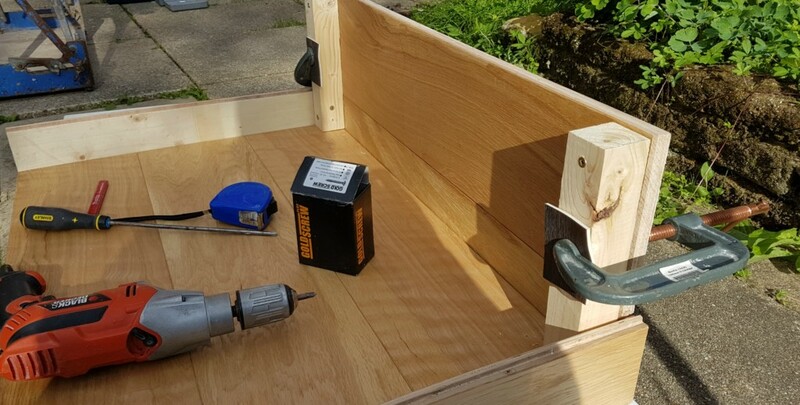 Measure and cut a support post for the two rear corners of the bed. These are to hold all the sides together and fix them to the base. 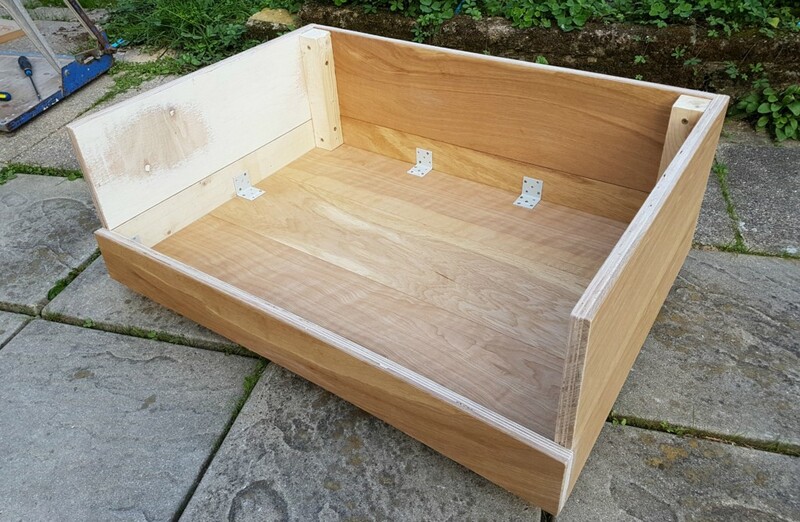 Place the sides up against the bed base with the posts in position. 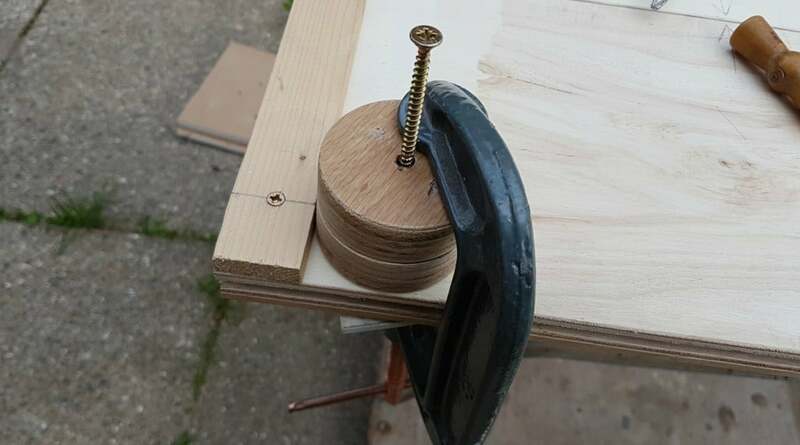 Screw the sides of the bed to the wooden support posts using wood screws. Next you now need to fix the sides to the base of the bed. I purchased some metal L-shaped brackets which I attached to the inside of the bed with wood screws to achieve this. 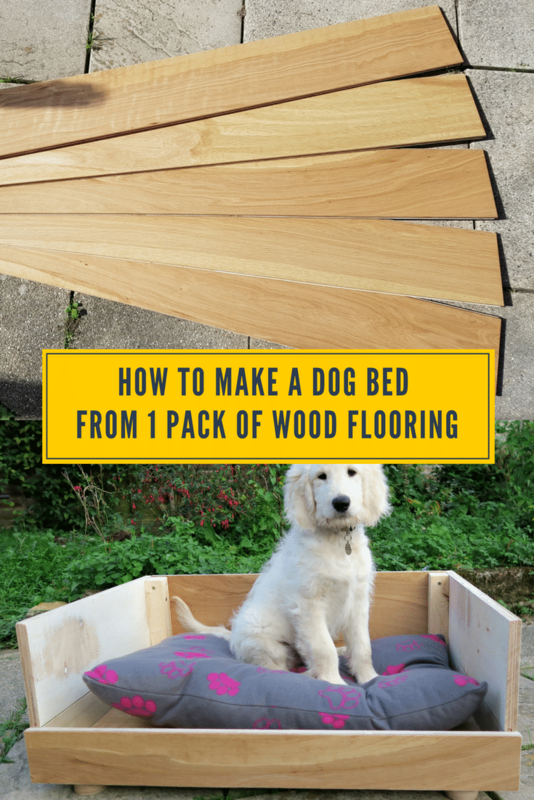 Now you need to cut a length of flooring for the front of the bed. 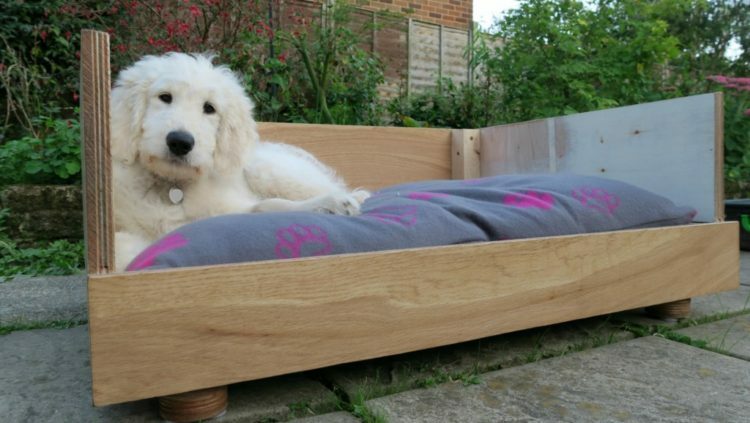 This needs to be shorter than the back and sides otherwise your dog wont be able to get into the bed! Same process as before, we used one length of flooring that was cut down to half its width. 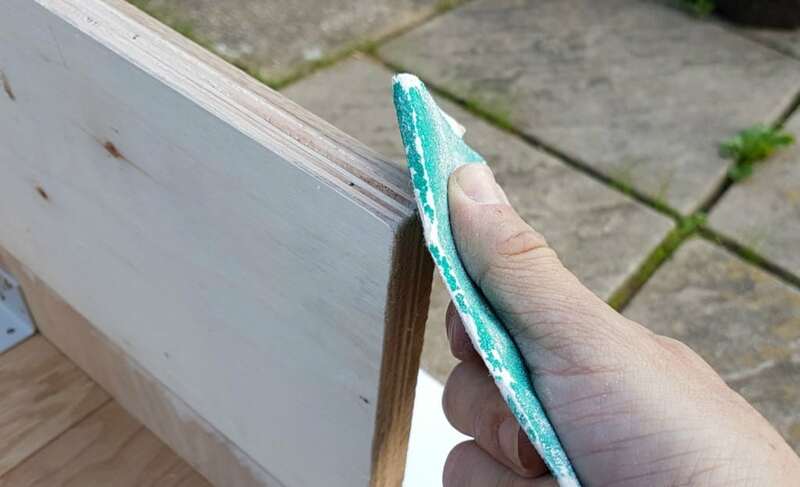 Give this length a little sand down to remove rough edges and then fix to the base and sides using the rest of L-shaped brackets. Now we needed some feet for the base. 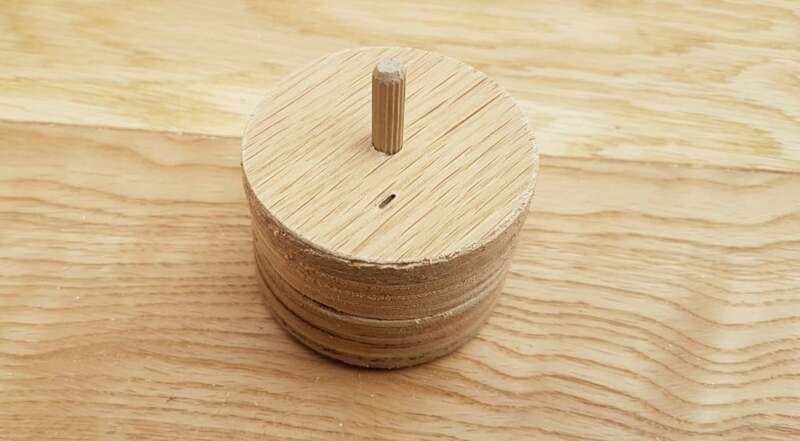 I used some the off cuts of the flooring and cut out some circular feet (8 in total) using a circular attachment for my drill. 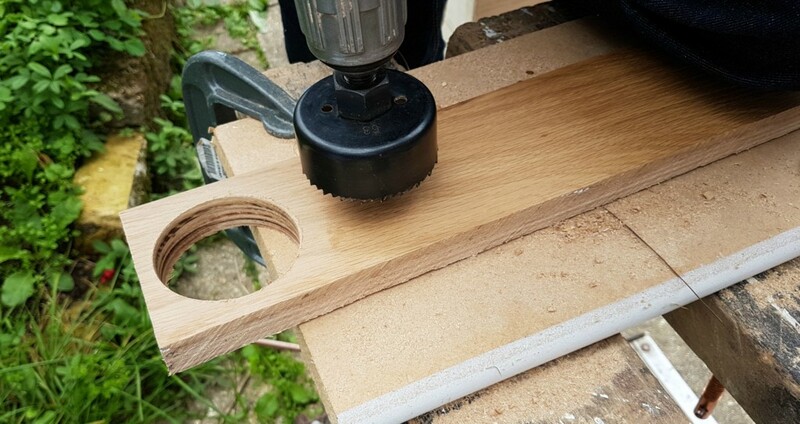 I glued these together to make them taller and the as the attachment drills a hole through the middle I inserted a small wooden dowel in the hole to give it some more strength. These feet were then screwed onto the underside of the base using the hole that the drill attachment made. Be careful not to use screws that are to long, you don’t want them sticking out of the base of bed! 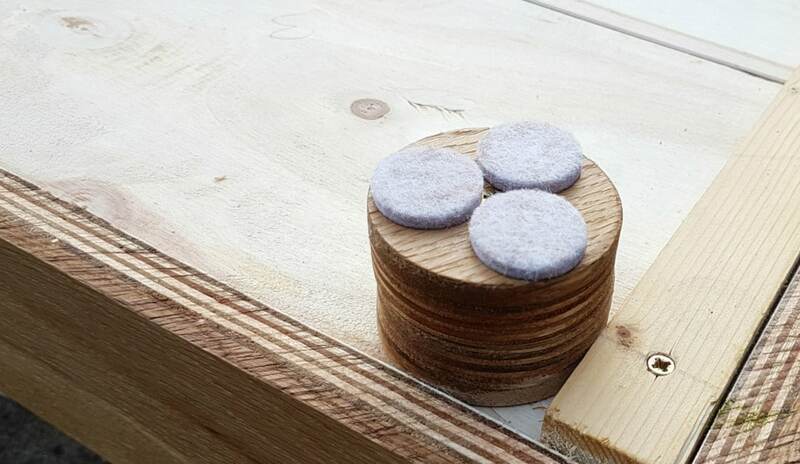 Give the whole dog bed a good sanding along all of the edges making sure there aren’t any sharp or rough edges. Added some felt pads to feet to stop scratching as we have laminate flooring. Great idea and he looks very pleased with it! your dog is so adorable. I’m so impressed that you were able to make this yourself! This is so cool. I bet we could make these for our dogs Yoda and Casper. Have you seen them on our Dogs Life category? Our dogs are so cute- as is GUS. He is adorable. I’m going to tell my hubby about this and bookmark the post. A brilliant idea!